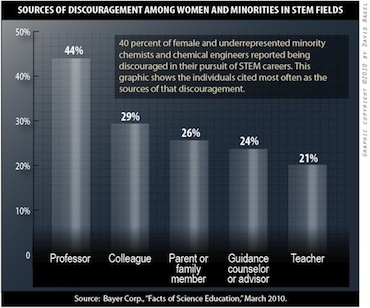 Significant numbers of women and minorities who made it into science careers were discouraged along the way. What's more, the bulk of those who said they've experienced discouragement most often cited their educational institutions as the offenders, according to a report released this week. Who were the worst offenders? College professors, according to the report, with 44 percent citing those individuals as a source of discouragement. That figure jumped up to high of 65 percent among black women and fell down to a low of 28 percent among Asian women. Colleagues, family members, advisors, and teachers were also cited--although teachers and family members were strongly reported as positive factors as well.